PREMIUM QUALITY WINE CHILLER BAG - Beautifully designed wine holder perfectly chills your bottle in less than 10 minutes, just add ice only! Transport your wine bottles with ease and protection, and enjoy any champagne, beer, red or white wine at its optimal temperature. TRAVEL AND DRINK WITH EASE - Caring about your to-go drinks is what we do, making this hassle free for any beach, pool parties, concerts, tailgates, hikes, camping trips, picnics, or even bachelorette parties. No more hesitation on accidental bottle breakages. LIGHTWEIGHT DESIGN - Strong and durable handles provide convenience in carrying any standard size wine bottle. No more dealing with those heavy ice buckets! Its collapsible and flat fold design, allows for easy storage in any home or travel wine kit. GREAT AS A GIFT- Our high-quality branded wine cooler bag is sure to impress friends and family. A perfect blend of fashion and function make this a great bridesmaid, house warming, and birthday gift for wine-lovers. A sophisticated wrapping for any Moet Chandon or Veuve Clicquot Champagne bottle, that is fabulous and fun. 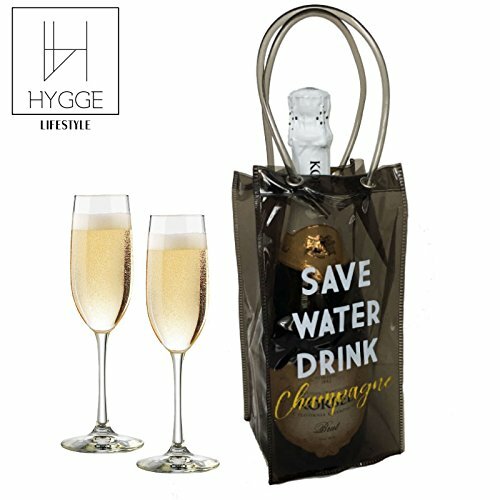 If you have any questions about this product by Hygge Lifestyle, contact us by completing and submitting the form below. If you are looking for a specif part number, please include it with your message.